Poppies on the Wheat. Before 1890 the most famous woman writer from Amherst wasn’t Emily Dickinson. I once thought that one of the marvels of Emily Dickinson is that she was able to create such revolutionary poetry without any supporting circle of fellow writers. She had poetic heroes: Shakespeare, Emily Bronte, Elizabeth Barrett Browning, but she never met them. Well, it turns out there’s a bit more to her story. Last year I followed a thread that her sister-in-law, neighbor, and friend Susan Dickinson wrote poetry, and as a result performed one of Susan’s poems “Crushed Before the Moth.” Interestingly, it sounds a bit like an Emily Dickinson poem. This year, I’m reading Genevieve Taggart’s biography of Emily Dickinson, one of the earliest written—researched in the 1920s when people in Amherst who knew Dickinson and her family were still living. And it’s inside that book that I met up with Helen Hunt Jackson. Helen Hunt Jackson: poet, novelist, activist. Helen was the same age and a childhood classmate of Emily Dickinson, but she married a brilliant military engineer and left town. * Taggart’s biography tells me that she returned to Amherst and visited Dickinson several times. By the 1860s Helen too was writing poetry. Like Emily Dickinson, Helen Hunt Jackson was connected with Thomas Higginson, the editor/abolitionist/feminist who Dickinson famously reached out to and corresponded with, and who helped edit the first collection of Dickinson’s poetry after Emily died. Helen and Emily exchanged work and discussed writing. Genevieve Taggart even says that Jackson was selecting work for her first collection of poetry while visiting with Dickinson. Unlike Dickinson, Jackson aimed to be published, and did so not only in magazines but eventually in over 20 books. ** While Thomas Higginson discouraged Dickinson from publishing, Helen Hunt Jackson adamantly urged her to. Jackson midwifed the publication in an anthology of one of Dickinson’s poems “Success is counted sweetest” the only poem of Dickinson’s published in a book during Dickinson’s lifetime. Did their writing influence each other? It’s hard to say. Jackson certainly didn’t convince Dickinson to become a publishing professional author, but another woman of the same age and town selecting and publishing books of poetry had to encourage Dickinson at least as much as the far-away Bronte and Browning. On the other hand, it seems that Dickinson had already written a great deal of her now famous work before she renewed her childhood friendship with Helen. I was intrigued to find out that Jackson wrote a novel in 1876 Mercy Philbrick’s Choice which featured a heroine who was socially reclusive, wore white and wrote poetry that some think might be a novelized tale of Emily Dickinson. I skimmed through it this week. At one point in the novel, a friend of the poet character sends two of her poems to a noted editor who responds favorably, and my heart leapt up, as this sounded like a description of Dickinson’s famous letter to Higginson. There seem to be other tantalizing passages that could be a friend roman à clef’ing Emily Dickinson. But one has to remember that the novel’s author herself, Jackson, is a poet, from the same age and home town. Mercy Philbrick could also contain elements of her own life and character. That certainly seems so of the title character’s poetry quoted in the book—it doesn’t sound at all like Dickinson. So, here’s today’s piece, a poem written by Helen Hunt Jackson about an Italian wheat field. It’s kind of a revoicing of Wordsworth’s famous “Daffodils” poem, but it has its own charm and details. We celebrate National Poetry Month here the same way we present poetry the rest of the year, a mix of the well-known and the forgotten. To hear my performance of Helen Hunt Jackson’s “Poppies on the Wheat,” use the player below. Want to follow along with the text while listening? Here’s the full text of the poem. *Emily met Helen’s husband Edward Bissell Hunt when the couple visited Amherst and Emily noted that he was one of the most fascinating men she’d ever met. Edward Hunt was killed at the Brooklyn Navy Yard during the Civil War while leading the testing of a top-secret weapon of his own design, a self-propelled torpedo. 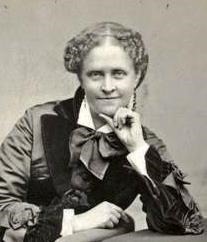 Helen remarried after Edward’s death extending her formal name to Helen Hunt Jackson, though she often published using the non-gendered pen name H. H.
**While her poetry is not well known today, Helen Hunt Jackson became a campaigner for Native American rights starting in 1879. In 1881 she published her first book under her own name, a book setting out the reasons for her cause A Century of Dishonor which she sent to every member of congress. Three years later she novelized about Native American issues and wrote a best-seller Ramona which has been characterized as Uncle Tom’s Cabin, only dealing with Native American mistreatment.